Do You Think Of Yourself First As American Or As Christian? Before I tell you the results, ask yourself how YOU would have responded had you been a participant in that poll. In all honesty, do you think of yourself first as American or as Christian? 7% said they see themselves as both equally—which may simply mean that they couldn’t commit themselves one way or the other. Apparently “sitting on the fence” is a virtue to some Americans. Unfortunately, in the Bible it’s not a virtue: it’s just the opposite! As some of you know, Jesus had some tough things to say in chapter 3 of the Book of Revelation to the members of the church of Laodicea—men and women who were “neither hot nor cold” when it came to living their Christian faith. I should also mention one more key finding in this survey: 62% of those who identified themselves as Evangelicals said they think of themselves as Christian first; whereas 62% of those who identified themselves as Catholics said they think of themselves as American first. The present political situation in “Catholic” Rhode Island makes much more sense, doesn’t it, when you hear that statistic? You see, if a person thinks of himself as American first, then his faith will only be a secondary consideration when he goes to the polls! And that’s precisely the way it is for a majority of Catholics in “Little Rhody” in almost every general election—which is why pro-abortion politicians usually win here so easily. All of this has a direct connection to the important feast we celebrate in the Church today, the Feast of Christ the King. In our first reading, from Daniel 7, the prophet sees a vision of an individual he describes as “one like a Son of Man”—a Son of Man who receives “dominion, glory and kingship” from “the Ancient One” (whom we know to be God the Father). This is what “is”; in other words, this is the objective truth. Jesus Christ is the King of kings and the Lord of lords to whom we owe our love and our complete obedience in every matter! But Jesus is not a king who imposes his rule upon us in the way that earthly kings usually did in the first century. If he had been that type of ruler, he certainly wouldn’t have responded to Pontius Pilate as he did in this Gospel scene. Rather, he would have summoned his “attendants”—his angels—immediately, and he would have brought Pilate to his knees, along with the rest of those who were trying to put him to death. But that’s not the way Jesus operates. On this side of the grave, Jesus simply invites every human person to acknowledge his authority and to make him their king. In the next life, of course, it will be a different story. There everyone will be forced to bend their knee to Jesus and acknowledge him as Lord—including those who are “under the earth” (as Scripture says). But here, we must freely choose to put him into first place in our lives. And so I ask you once more: Do you think of yourself first as American or as Christian? If you think of yourself first as American, then you will do whatever you have to do to realize the “American dream”—even if it involves lying, and cheating, and stealing, and manipulating the system a little bit. Your ultimate desire will be for self-gratification; what will matter most to you is “you”! Your role models will be people like Donald Trump and Hugh Hefner—people who “have it all”; people who have “made it to the top”. You might pay lip service to Jesus for an hour on a Sunday morning, but ultimately your desire for worldly success will override the rule of Christ and his Gospel in your life. If, on the other hand, you think of yourself as Christian first, then you might still pursue the material blessings of the American dream, but you’ll definitely try to do it in a moral manner. The law of your king, Jesus Christ, will be your guide along the way. Your public life—and your personal life—will be lived according to the Golden Rule, not the rule of hedonists like Hugh Hefner, who say “Do whatever you feel like doing”. It’s an interesting irony, is it not? If you think of yourself as American first, you run the risk of being a very bad Christian—and ultimately a bad and an immoral American. But if you think of yourself as Christian first—and freely choose to enthrone Jesus Christ as your Lord and King—you’ll likely be a very good Christian, and, at the same time, a great American! Sebastian Cabot as "Mr. Pip"
Every once in awhile, an old Twilight Zone program pops into my mind as I’m preparing a homily. And so it was this past week. 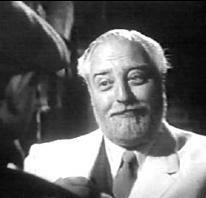 The episode in question starred the bearded and rather rotund Sebastian Cabot (you may remember him as Mr. French, the butler on the old show “Family Affair”). In this particular Twilight Zone program Cabot played an outwardly friendly but very strange individual named “Mr. Pip”. The story begins when a professional burglar named Rocky Valentine is shot by a policeman while he’s in the process of robbing a pawnshop. When Rocky wakes up, he’s surprised to find that he’s unhurt and in the presence of Mr. Pip. Pip introduces himself and explains that he is Valentine’s guide. He also tells Rocky that he’s been instructed to give him whatever he wants. Thinking that he’s died and gone to heaven, Rocky happily accepts the offer! He begins by asking for lots of money, and Mr. Pip gives it to him; he then asks for beautiful women to spend time with, and suddenly every girl he sees falls in love with him immediately. Rocky even asks for success at the casino—and Mr. Pip sees to it that he never loses. For about a month, everything is great. Rocky loves it! The situation seems to be perfect! I think our former Holy Father, Pope John Paul II, would have enjoyed this Twilight Zone episode immensely, because one of his favorite lines—one that he quoted time and time again in his many writings—was this one: “Man cannot fully find himself, except through a sincere gift of himself.” This, incidentally, was one of his favorite quotes, because it’s taken from one of the documents of Vatican II, Gaudium et Spes, which he helped to write when he was a young Polish bishop and theologian named Karol Wojtyla. “Man cannot fully find himself, except through a sincere gift of himself.” Rocky, the fictional character in this Twilight Zone program, didn’t know that. He thought a person discovered himself and fulfilled the meaning of his existence through taking and grabbing and satisfying his every desire. That’s why he was a thief when he was alive on earth, and it’s why he responded to Mr. Pip’s invitation as he did in the afterlife. This philosophy, of course, is not unique to Rocky Valentine, the fictitious burglar. It’s also embraced by many people in the real world. And that explains, at least in part, why there are so many “lost souls” around—lost, not only because they don’t know God and the meaning of life; but lost because they’re almost totally wrapped up in themselves and in their own wants and desires. And it’s really a cultural problem, isn’t it? Let’s fact it, in many dimensions of our culture—in music, in movies, in advertising, for example—we’re given the message that self-indulgence is the way to go; that self-indulgence is the way to find a kind of “heaven” here on earth. But the sad reality—and the sad irony—is that when people actually embrace this message of selfishness and go with it, their lives quickly become “like hell”. Life is not about me, me and me; it’s about God, me and others. Some of you will recall the old story about the man who was given a vision of hell. In this vision he saw a long banquet table covered with gourmet foods cooked to perfection. But the people who were sitting on either side of the table weren’t able to eat any of the food. The problem was that they had these huge forks and spoons strapped to their arms, such that they couldn’t bend their elbows. And so they couldn’t get any of this marvelous food into their mouths! Then the same man was given a vision of heaven. At first, he was surprised because he saw the very same set-up: the same long banquet table, the same gourmet foods, and the same long forks and spoons strapped to the arms of the people sitting there. The only difference was that in heaven they fed one another! Each person fed the man or the woman who was sitting across from them at the table. I mention this at this Mass because in today’s Gospel story a poor widow gives of herself by putting two small coins into the Temple treasury. It was, as Jesus said, “her whole livelihood”. The gift of self begins with the idea that we are a community of persons, each of whom is made in the image and likeness of Almighty God. This woman obviously understood that. And so, out of love for God and neighbor she shared what she had. So I’ll begin by throwing out that question for reflection: How generous are you to your parish and to other worthy causes in the community? Do you at least tithe on what you earn? In other words, do you give at least 10 percent of your gross earnings to charity? Barring extreme financial circumstances, every Catholic and every Christian—as well as every Jew—should, since tithing is a biblical mandate that goes back to the Old Testament. And I include the young people in this as well! I’ve noticed that most of you have lots of money to spend on prom attire and movies and music downloads from iTunes. But what do you give, financially speaking, to charity? What do you put into the collection basket on Sunday? And what about time and talent? Giving of yourself means more than just giving financially; it also means sharing your gifts and talents with your brothers and sisters. How eager are you to do this? There are certainly lots of opportunities for that right here in this parish: Chris Magowan, for example, our DRE, is always looking for help in our religious education program; Richie, our organist, is always looking for those who have musical talent to volunteer to share their gifts here at Mass; the Legion of Mary is always looking for people to visit the sick and shut-ins of our community; Rick and Kay Dudley are always looking for help with the latest Habitat Project; today we’ll be asking for volunteers to assist us with our parish “Giving Tree”; soon we’ll even be looking for people to help with our capital campaign. Well, fear not. If that’s your situation, I have an alternative to propose: you can use your time well and do a lot to help others by simply offering up your sufferings! You can offer up your aches and pains and frustrations for the conversion of sinners, and for the good works that other people are doing in the parish and in the community at large. That, by the way, is certainly what Blessed Mother Teresa of Calcutta would tell you to do. I can almost guarantee it! Many are not aware of this, but in her ministry Mother Teresa relied very heavily on a group of people who came to be known as her “sick and suffering co-workers”. These were men and women all over the world who said they were willing to offer up their sufferings to God, so that Mother and her sisters would receive the grace and strength they needed to minister to the poor, the sick and the dying in Calcutta and in many other places. These “sick and suffering co-workers” understood that offered-up suffering is just like offered-up prayer: it draws down God’s blessings upon us and upon others. So, you see, there’s really no excuse for failing to share our time and our talent and our treasure with other people. Even if we’re very old, and even if we’re very sick, we can still do it. The only question is: Will we? The First Great Commandment: Always A Goal, Never An Achievement. The Second Great Commandment: An Achievement, But Not A Constant One. A man and woman had been married for more than 60 years. They raised 3 children; they also had several grandchildren and even a few great-grandchildren. 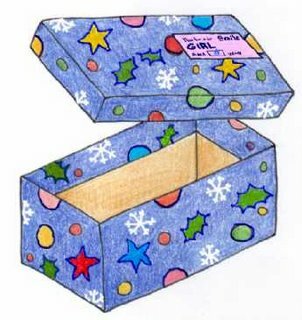 They had been faithful to one another for 6 decades and had kept no secrets from each other during that time—with one small exception: the woman kept an old shoebox on the top shelf of her bedroom closet, and she refused to let her husband see what was inside of it. In fact, she told him in no uncertain terms that he was never even to question her about its contents. Not long after their 60th anniversary, the woman came down with a very serious illness. She was bedridden, and very weak. The doctor told her that she probably wouldn’t recover. One day her husband was getting something out of her closet, and he spotted the old shoebox. He took it to her bedside and asked if she’d be willing to tell him, at long last, what was in it. When he took the cover off, he found two little crocheted dolls inside along with some money. The money totaled $95,000! Her husband was touched; he had to fight back the tears. After all, there were only two dolls in the box. That’s hard—especially when your “neighbor” is someone you have to deal with on a daily basis: your spouse (even if you haven’t been married for 60 years! ), your parent, your brother or sister, your annoying co-worker. And yet, when you stop and think about it, on the surface at least this commandment really isn’t all that demanding. It doesn’t say, for example, that we should—or must—love other people with all our heart, all our soul, all our mind and all our strength (that’s the way we’re supposed to love God); it simply says we should love our neighbor as we love ourself. The problem, of course, is that many of us love ourselves a lot—and sometimes too much. We might even love ourselves with a false or misguided love. But even if we have a healthy love of self (the kind that Jesus would approve of), the fact is it’s very often much greater than the love we have for other people. And that’s fairly easy to demonstrate. I ask you today: How patient are you with other people? Specifically, are you as patient with other people as you are with yourself? I don’t know about you, but very often I’m much more patient with myself when I make mistakes and say the wrong things than I am with others when they make the very same mistakes and say the very same wrong things. That’s the tendency we have because we share a fallen human nature. It’s important that we recognize it. St. Paul also speaks in 1 Corinthians 13 about forgiveness. He says, “Love does not brood over injuries.” Another question that can make us aware of the fact that we sometimes love ourselves more than we love others is this one: Do I expect others to forgive me for things that I would refuse to forgive them for? Jesus said, “You shall love your neighbor as yourself”—and love includes forgiveness. One footnote needs to be added here . . . Although most people have the tendency to love themselves too much, there are some who do have the opposite problem: they love themselves less than they love others. And that’s just as wrong. In fact, a few don’t love themselves at all; they’re filled, sad to say, with self-hate. If they’re ever going to be faithful to the second great commandment, these men and women will need inner healing—the healing of their hearts, minds and souls. We should pray that they receive it. Hopefully I’ve made it clear that observing the second great commandment on the practical level is anything but easy. But as difficult as it might be to love your neighbor as you love yourself, it’s really a ‘piece of cake’ compared to the first commandment Jesus gives us in this story. I think we’d all agree that it would be challenging enough if Jesus had said that we need to love God as we love ourself. But he went way beyond that. He said we must love God with our heart, soul, mind and strength: and not with “some” of our heart and “some” of our soul and “some” of our mind and “some” of our strength; not even with “most” of our heart and “most” of our soul and “most” of our mind and “most” of our strength. He said we have to love the Lord our God with everything: with ALL our heart and ALL our soul and ALL our mind and ALL our strength! Not a single hand went up—thankfully! I said, “But this commandment still applies to us today. Can anyone tell me how?” Again, not a single hand went up. So I went over to the blackboard and drew three items: a dollar bill, a football, and a basketball. The bottom line is this, my brothers and sisters: even for the best among us, the first great commandment of Jesus—to love God above all things—is always a GOAL; it’s never an ACHIEVEMENT on this side of the grave. 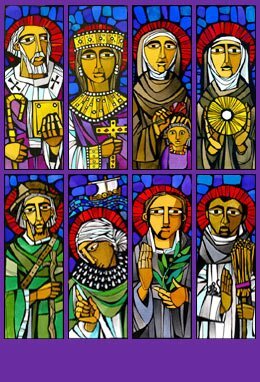 With the exception of Mary, it wasn’t even an achievement for the great saints. Even they fell short, albeit in small ways. The second—the commandment to love our neighbor—is an achievement (thanks be to God), but definitely not a constant one. Which explains why we’re here, doesn’t it? You see, if we loved God and our neighbor always and perfectly, we wouldn’t need to pray! We wouldn’t need Mass or Confession or any of the other sacraments. We wouldn’t need God’s grace, or the power of the Holy Spirit. And hopefully we all realize that we do. In the Nicene Creed, which we profess every Sunday and Holy Day, we proclaim our faith in “the resurrection of the dead and the life of the world to come”. As Christians, we believe that there’s a life beyond this one, which our souls (and eventually our bodies) will experience when our time on this earth is over. At the beginning of each November, the Church rivets our attention on the reality of the resurrection and its importance by giving us two special feasts: the one we celebrate today (All Saints Day), and the one we celebrate tomorrow (All Souls Day). Tomorrow, on the other hand, we will focus on those who are still on the way (so to speak): on those who died in the state of grace but now need some final purification before they can enter the Lord’s presence and see him face to face. All of this reminds us of something that we can easily forget. In addition to helping us remember that this life is not the only one, these two feasts remind us of the fact that all of God’s children are mysteriously and spiritually connected to one another (and that includes those children of the Lord who are no longer living among us on this earth!). This is a doctrine, incidentally, which has some very practical implications. We need to recall it whenever someone close to us dies—but especially when the relationship we had with the deceased person wasn’t a very good one. We all know that death is a time of mourning (that’s obvious); but for many people death is also a time of guilt and regret: guilt because they offended their deceased relative or friend in some way and never made proper amends; regret because they didn’t do more to assist their deceased relative or friend in a time of need. Not true! You see, the doctrine of the communion of saints tells us that the death of the body does not mean the death of the relationship. Please hear that: the death of the body does not mean the death of the relationship (provided the deceased died in the state of grace). So yes, we may have failed our relative or friend in some way when they were alive on this earth—and that’s definitely something we need to seek God’s forgiveness for (if necessary in the sacrament of Confession). But if our relative or friend has gone either to heaven or to purgatory, our bond with them has not been severed! It still exists! And so—depending on where they are—they can help us, or we can help them. If they’re in heaven, for example, they can (and will) help us by their prayers—especially their prayers for our repentance and conversion. And, in the process, they will harbor no grudges or animosity against us for our sins against them (since none of that bad “stuff” can exist in God’s kingdom). And if they’re in purgatory (which we must presume they are, unless they’ve been canonized by the Church), we can help them by the prayers we offer up, and the Masses we have said, and the personal sacrifices we make for the repose of their soul. The communion of saints teaches us that those prayers and Masses and sacrifices will help them to get through purgatory and into heaven more quickly—and will make their prayers for us more effective while they’re still in the process of being purified. So I ask you today: Did you leave something unsaid to a relative or friend who died in the recent or even in the far distant past? Did you fail them in some way? Well, don’t despair! Rather, do something for them NOW: have a Mass said for the repose of their soul; say a Rosary or some other prayer for them every day (or at least every once in a while). You might even fast on occasion from something—or make some other personal sacrifice—so that their soul will get into heaven more quickly. Your relative or friend will certainly know what you’re doing for them, and they will be pleased. They will also be blessed—and deeply grateful. And when you join them in heaven someday (God willing), they will probably give you a really big hug, and say thank you.